In most cases of DI-ILD, patients are relatively asymptomatic and respond well to therapy; therefore, drug-related toxicity often goes unsuspected, especially in its early phases. A high level of suspicion is necessary, however, as most pulmonary drug toxicities are associated with significant morbidity and mortality.2,4 A careful risk-benefit assessment of each drug is warranted, as only routinely successful treatment for toxicity is withdrawal of the offending drug before the injury becomes too extensive or irreversible. Radiologists are often the first to raise a red flag when interpreting images; thus, they are instrumental in modifying patient management in such cases. This article highlights some of the most common causes of drug-induced ILD, as well as some new key offenders, and reviews their presentation. The first presentation of any ILD is generally shortness of breath or cough.4 Other associated symptoms include fatigue, fever and weight loss. Physical exam findings may include crackles on auscultation, digital clubbing, a restrictive pattern on pulmonary function tests and impaired gas exchange.7 Laboratory studies are mostly non-contributory. A multi-modality approach is often needed to make a diagnosis, with pertinent information and expertise contributed by the pulmonologist, radiologist and pathologist.4 High-resolution CT should be obtained in virtually all patients with a suspected ILD.4 Additional diagnostic workup can include bronchoalveolar lavage, transbronchial biopsy and surgical lung biopsy when indicated. The mechanism of action of toxicity is largely unknown for most drugs and is an active area of research.11 In general, effects can be attributed to direct cell toxicity, free radical production, alterations in collagen production, or indirect inflammatory mediated events.1,2 Understanding these mechanisms can help explain the different imaging patterns of lung toxicity. Diffuse alveolar damage (DAD) is a pathology term that describes the presence of alveolar fibrin, hyaline membranes and reactive epithelial cells within alveoli, with varied stages of inflammation.8,12 This is mediated by direct epithelial cell apoptosis and significant damage to the alveolar epithelial barrier (Figure 1).11Acutely, there is cell death of type I pneumocytes, which normally provide a barrier for 97% of the alveolar surface.1 Type II pneumocytes then begin to proliferate and eventually transform into type I pneumocytes to restore the barrier.11 Meanwhile, the alveolar wall is vulnerable and can become edematous; additionally, protein-rich exudates can leak across the weakened wall and flood the alveolus.12 Hyaline membranes--which are effectively a collection of necrotic cell debris and excreted proteins--are secreted to wall off the alveolus and stop oxygen transfer into the damaged alveolus.12 A period of organization then occurs, with organizing fibroblastic tissue filling the alveolar space and interstitium.12 At this point two potential outcomes are possible: recovery and removal of excess fibrin, or permanent fibrosis. The corresponding imaging findings of DAD include diffuse ground glass opacities and septal thickening with associated areas of consolidative opacities (Figures 1,2).12 In severe cases, consolidative opacities can become confluent.1 There can be significant volume loss in patients who progress to alveolar collapse.12 While DAD can result in fibrosis, it is often reversible.1 Prompt withdrawal of the offending drug is the most effective treatment. Diffuse alveolar damage is currently associated with 51 different drugs on the pneumotox website.3 These include the antiarrhythmic drug amiodarone, the chemotherapeutic agents bleomycin, busulfan, carmustine and cyclophosphamide, the immunosuppressive drugs sirolimus and everolimus and many others. Indirect cell toxicity from drug metabolites is another pathway by which DI-ILD may occur.2 Of particular importance are drugs that produce reactive oxygen species during metabolism. Oxidative stress may cause apoptosis of structural cells making up the interstitium, thus playing a role in fibrosis.11 This may explain why drugs such as nitrofurantoin and bleomycin are more likely to cause DI-ILD in the presence of supplemental oxygen,8 and can lead to rapid progression of interstitial abnormality on high-flow oxygen therapy. The imaging pattern of OP is heterogeneous, but the most common pattern is scattered consolidative opacities in a bilateral and peripheral distribution (Figure 3 and 4).12 Nodular opacities, including centrilobular nodules, can also be observed. A hallmark of this pattern is that opacities tend to migrate on sequential imaging with a waxing and waning appearance.12,18 Other findings that help make the diagnosis are confirmatory pathology, lack of prominent findings on BAL, lack of tissue eosinophilia, and known exposure to the suspected drug. Drugs responsible for this pattern include chemotherapy agents (bleomycin, cyclophosphamide) and immunosuppressive agents (sirolimus, tacrolimus, methotrexate, and gold salts). Steroids and drug cessation are treatment mainstays. Eosinophilic pneumonia is similar to organizing pneumonia in pathophysiology, but is mediated instead by an inappropriate increase in the number of eosinophils and macrophages in alveoli. Drugs related to this pathology finding are also often immune modulators. For example, mesalamine, a drug used for ulcerative colitis, has been shown to result in lung toxicity with an eosinophilic pneumonia pattern.26 Daptomycin, implicated in dozens of cases of eosinophilic pneumonia, is thought to act via an antigen-mediated process whereby alveolar macrophages and T-helper cells are activated.27 The imaging hallmark of eosinophilic pneumonia is peripheral opacities with an upper-lobe-predominant distribution (Figure 5). Approximately 115 drugs have been reported to present with this toxicity pattern, including methotrexate and amiodarone. Other drugs responsible for this pattern include immunosuppressive agents (penicillamine), antibiotics (sulfasalazine, nitrofurantoin) and NSAIDS. The imaging pattern is typically diffuse ground glass opacification without associated interstitial thickening, poorly defined centrilobular ground glass nodules and mosaic attenuation.28 The mosaic attenuation pattern reflects air trapping from underlying obliterative bronchiolitis.28 Chronic HP can progress to an IPF pattern, with reticular opacities and honeycombing.28 Emphysema is another finding seen in chronic HP.28 Hypersensitivity pneumonitis is commonly associated with pencillamine, sulfasalazine, nitrofurantoin, NSAIDS, progesterone, paclitaxel, docetaxel and imatinib. There are two main imaging patterns of pulmonary fibrosis: Idiopathic pulmonary fibrosis (IPF) and non-specific interstitial pneumonitis (NSIP). NSIP, the most common pattern of fibrosis seen in DI-ILD, is characterized by basal-predominant subpleural reticular opacities, an absence of honeycombing pattern and scattered ground glass opacities.1 An IPF pattern is distinguished from NSIP in that it is associated with honeycombing and traction bronchiectasis and is more likely to be subpleural. Features inconsistent with fibrosis include extensive ground-glass abnormality out of proportion to reticular opacities, micronodules, a mid- or upper lung predominance and consolidative opacities in a bronchopulmonary segment or lobe. There are currently 75 drugs associated with pulmonary fibrosis, including amiodarone, bleomycin, busulfan, carmustine, lomustine and nitrofurantoin. Pulmonary hemorrhage is a rare complication of DI-ILD, but is seen with anticoagulants, anti-fungals (amphotericin B), chemotherapeutic agents (mitomycin, Ara-C, high-dose cyclophosphamide), cardiac medications (amiodarone) and immunosuppressive agents (penicillamine).1 Some of these patients will present with hemoptysis in addition to acute dyspnea — penicillamine is particularly implicated in this finding. The radiographic appearance is typically parenchymal opacities in a geographic distribution. Patients react differently to medications, and often genetic and environmental factors can contribute to an atypical reaction.2 Genetic polymorphisms have also been implicated and are a possible explanation of why some groups of people are more likely than others to develop drug toxicity; indeed, the presence of certain variant cytochrome P-450 (CYP) alleles was strongly associated with development of DI-ILD in a Dutch study, with odds ratios ranging from 3.25 to 40.8.39 Dosage is also a factor, particularly with certain medications such as amiodarone, bleomycin and BCNU.2 Extremes of age are also associated with increased risk. Multiple medications will also increase risk, with certain combinations leading to synergistic reaction with worrisome consequences. Diagnosing DI-ILD remains challenging, as different patterns can overlap and the appearance is often similar to the underlying disease process and infections. The diagnosis is generally made by exclusion and careful linkage of findings and symptoms with administration of the implicated drug.2 In most cases, even after identifying and eliminating the causal agent, transbronchial lavage or biopsy is often needed to exclude infection, prior to administration of steroids. Radiologists play a key role in early identification and triaging the patient to optimal management strategy. Erasmus JJ, Mcadams HP, Rossi SE. 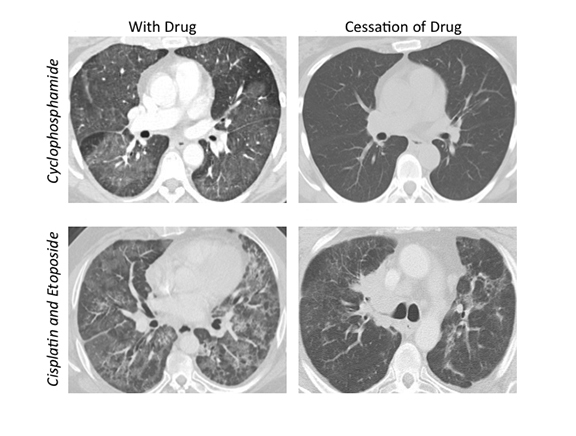 Drug-induced lung injury. Semin Roentgenol. 2002;37(1):72-81. Schwaiblmair M, Behr W, Haeckel T, et al. Drug induced interstitial lung disease. Open Respir Med J. 2012;6:63-74. Wallis A, Spinks K. The diagnosis and management of interstitial lung diseases. Br Med J. 2015;350:1-12. Mehrad B, Strieter RM. Fibrocytes and the pathogenesis of diffuse parenchymal lung disease. Fibrogenesis Tissue Repair. 2012;5 Suppl 1(Suppl 1):S22. Kadoch MA, Cham MD, Beasley MB, et al. Idiopathic interstitial pneumonias: A radiology-pathology correlation based on the revised 2013 American Thoracic Society-European Respiratory Society Classification System. Curr Probl Diagn Radiol. 2015;44(1):15-25. American Thoracic Society/European Respiratory Society. International multidisciplinary consensus classification of the idiopathic interstitial pneumonias. Am J Respir Crit Care Med. 2002;165(2):277-304. Danson S, Blackhall F, Hulse P, et al. Interstitial lung disease in lung cancer: Separating disease progression from treatment effects. Drug Saf. 2005;28(2):103-113. Hallowell RW, Horton MR. Interstitial lung disease in patients with rheumatoid arthritis: spontaneous and drug induced. Drugs. 2014;74(4):443-450. Higenbottam T, Kuwano K, Nemery B, et al. Understanding the mechanisms of drug-associated interstitial lung disease. Br J Cancer. 2004;91 Suppl 2:S31-S37. 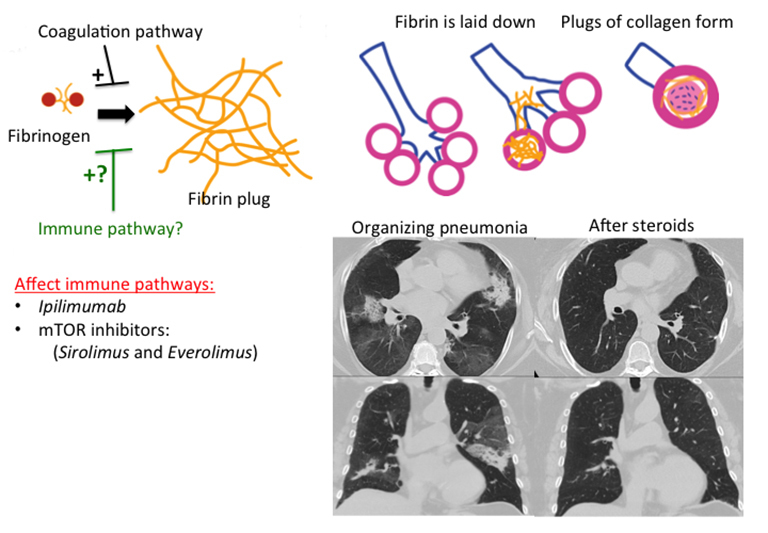 Kligerman SJ, Franks TJ, Galvin JR. Organization and fibrosis as a response to lung injury in diffuse alveolar damage, organizing pneumonia and acute fibrinous and organizing pneumonia. Radiographics. 2013;33(7):1951-1975. Almeida B, Silva A, Mesquita A, et al. Drug-induced apoptosis in yeast. Biochim Biophys Acta. 2008;1783(7):1436-1448. Mahavadi P, Henneke I, Ruppert C, et al. Altered surfactant homeostasis and alveolar epithelial cell stress in amiodarone-induced lung fibrosis. Toxicol Sci. 2014;142(1):285-297. Bolt MW, Card JW, Racz WJ, et al. 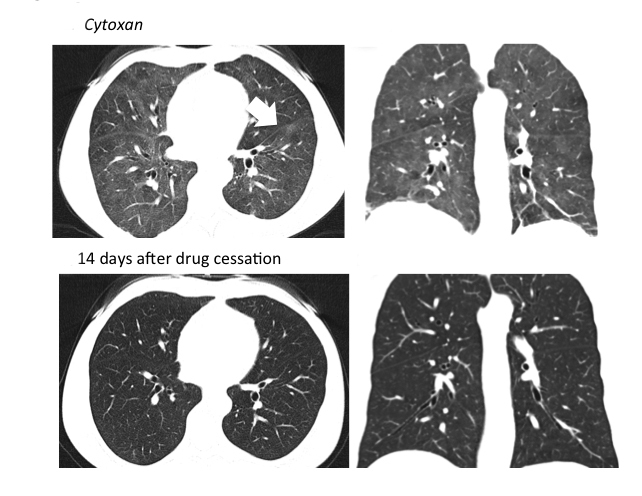 Disruption of mitochondrial function and cellular ATP levels by amiodarone and N-desethylamiodarone in initiation of amiodarone-induced pulmonary cytotoxicity. J Pharmacol Exp Ther. 2001;298(3):1280-1289. Okamoto I, Fujii K, Matsumoto M, et al. Diffuse alveolar damage after ZD1839 therapy in a patient with non-small cell lung cancer. Lung Cancer. 2003;40(3):339-342. Takeda M, Okamoto I, Tsurutani J, et al. Clinical impact of switching to a second EGFR-TKI after a severe AE related to a first EGFR-TKI in EGFR-mutated NSCLC. Jpn J Clin Oncol. 2012;42(6):528-533. Cordier JF. Organising pneumonia. Thorax. 2000;55(4):318-328. Delvaeye M, Conway EM. Coagulation and innate immune responses: Can we view them separately? Blood. 2009;114(12):2367-2374. Mukae H, Kadota JI, Kohno S, et al. Increase of activated T-cells in BAL fluid of Japanese patients with bronchiolitis obliterans organizing pneumonia and chronic eosinophilic pneumonia. Chest. 1995;108(1):123-128. Khater FJ, Moorman JP, Myers JW, et al. Bronchiolitis obliterans organizing pneumonia as a manifestation of AIDS: Case report and literature review. J Infect. 2004;49(2):159-164. Chaparro C, Chamberlain D, Maurer J, et al. Bronchiolitis obliterans organizing pneumonia (BOOP) in lung transplant recipients. Chest. 1996;110(5):1150-1154. Baas MC, Struijk GH, Moes DJ, et al. Interstitial pneumonitis caused by everolimus: A case-cohort study in renal transplant recipients. Transpl Int. 2014;27(5):428-436. Säemann MD, Haidinger M, Hecking M, et al. The multifunctional role of mTOR in innate immunity: Implications for transplant immunity. Am J Transplant. 2009;9(12):2655-2661. Tanigawa K, Sugiyama K, Matsuyama H, et al. Mesalazine-induced eosinophilic pneumonia. Respiration. 1999;66(1):69-72. Phillips J, Cardio AP, Patterson TF, et al. Daptomycin-induced acute eosinophilic pneumonia: Analysis of the current data and illustrative case reports. Scand J Infect Dis. 2013;45(10):804-808. Hirschmann JV, Pipavath NJ, Godwin, et al. 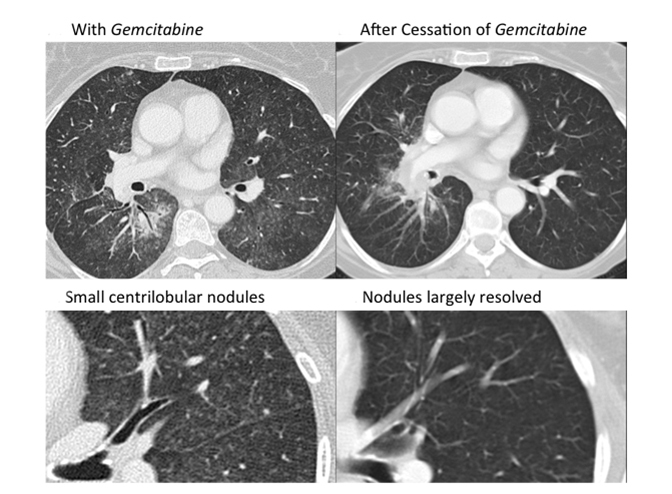 Hypersensitivity pneumonitis: A historical, clinical , and radiologic review. Radiographics. 2009;29(7):1921-1938. Baur X, Fischer A, Budnik LT. Spotlight on the diagnosis of extrinsic allergic alveolitis (hypersensitivity pneumonitis). J Occup Med Toxicol. 2015;10(1):15. Patel AM, Ryu JH, Reed CE. Hypersensitivity pneumonitis: Current concepts and future questions. J Allergy Clin Immunol. 2001;108(5):661-670. Lee SH, Kim M, Lee K, et al. Hypersensitivity pneumonitis caused by cephalosporins with identical R1 side chains. Allergy Asthma Immunol Res. 2014; 25:1-5. 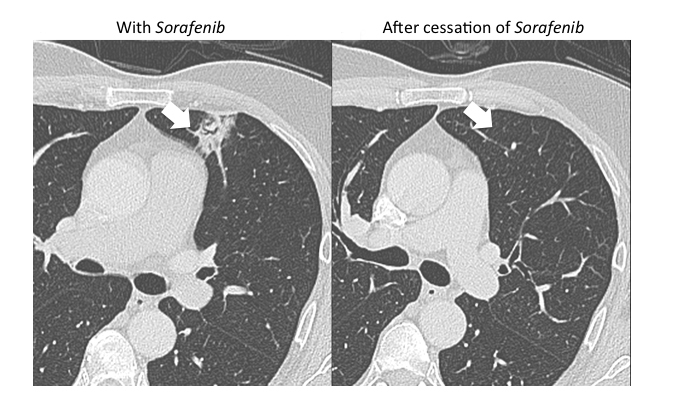 Taj A. Docetaxel-induced hypersensitivity pneumonitis mimicking lymphangitic carcinomatosis in a patient with metastatic adenocarcinoma of the lung. Hematol Oncol Stem Cell Ther. 2013;6(3-4):117-119. Bagnato G, Harari S. Cellular interactions in the pathogenesis of interstitial lung diseases. Eur Respir Rev. 2015;24(135):102-114. Thannickal VJ, Horowitz JC. 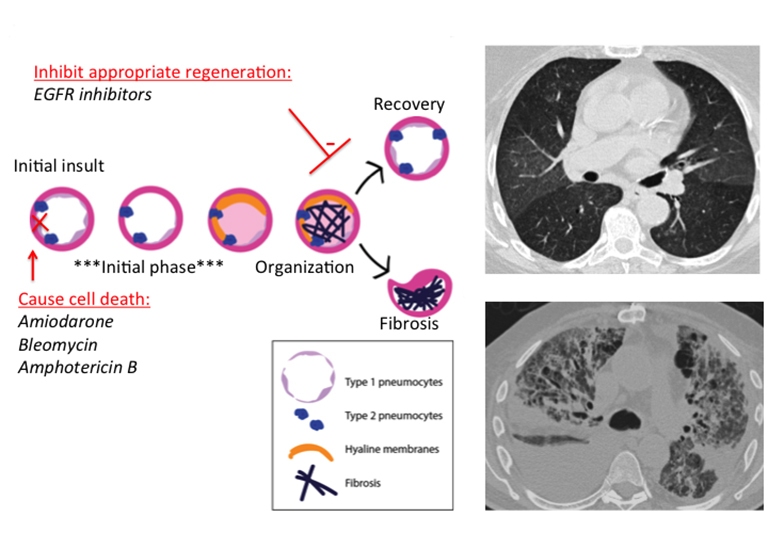 Evolving concepts of apoptosis in idiopathic pulmonary fibrosis. Proc Am Thorac Soc. 2006;3(4):350-356. Hsu E, Shi H, Jordan RM, et al. Lung tissues in patients with systemic sclerosis have gene expression patterns unique to pulmonary fibrosis and pulmonary hypertension. Arthritis Rheum. 2011;63(3):783-794. Iyer AK V, Ramesh V, Castro CA, et al. Nitric oxide mediates bleomycin-induced angiogenesis and pulmonary fibrosis via regulation of VEGF. J Cell Biochem. 2015. doi:10.1002/jcb.25192. Blaauboer ME, Boeijen FR, Emson CL, et al. 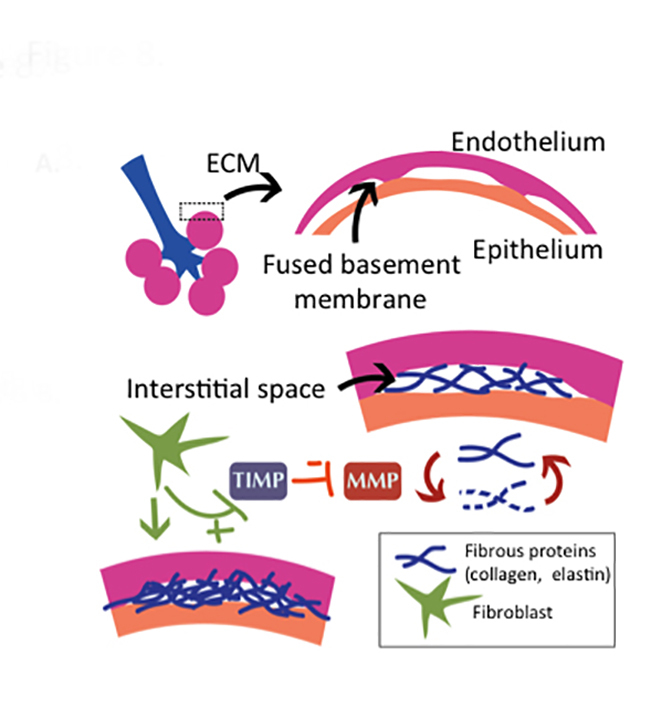 Extracellular matrix proteins: A positive feedback loop in lung fibrosis? Matrix Biol. 2014;34:170-178. Wang C, Xuan X, Yao W, et al. Anti-profibrotic effects of artesunate on bleomycin-induced pulmonary fibrosis in Sprague Dawley rats. Mol Med Rep. 2015;12(1):1291-1297. Wijnen P, Drent M, Nelemans P, et al. Role of cytochrome P450 polymorphisms in the development of pulmonary drug toxicity: A case-control study in the Netherlands. Drug Saf. 2008;31(12):1125-1134. Pelosi P, Rocco PM, Negrini D, et al. The extracellular matrix of the lung and its role in edema formation. An Acad Bras Cienc. 2007;79(2):285-297. Ripley BA, Kelil T, Gill RR. Deciphering drug-induced interstitial lung disease: A mechanistic approach. Appl Radiol. 2016;45(4):9-18. Dr. Ripley, Dr. Kelil and Dr. Gill are radiologists at Brigham and Women's Hospital and Harvard Medical School, Boston, MA.